Praise be to Allah ﷻ and peace be on Prophet ﷺ, learning and gathering knowledge on ‘iman’ (faith) is the foremost and principal concern shown in Quranul karim and Sunnah-of-Prophet. There are no other important issues as ‘iman’ in Islami shariah. Even, only ‘iman’ will be the way to salvation in the hereafter. A person with ‘iman’ may receive punishment in the Jahannam (hell fire) for his wrong actions of this world but would not reside there forever. On the other-hand, without proper and pure ‘iman’, all types of prayers and philanthropic actions will be wasted and meritless. This is because without ‘iman’, no acts of worship will be accepted in the glorious court of Allah ﷻ. Whilst if someone who have worshiped Allah ﷻ with iman may expect to be salvaged from hell fire and reach Jannah (paradise) directly. Allah has bestowed few responsibilities in relation to ‘iman’ on every m’umin muslim. After accepting ‘iman’, one has to make it firm and strong and practicing through the ‘act of dawah’. Keeping ‘iman’ in its purest form by not making ‘kufr’ or ‘shirk’, i.e. not doing or saying anything that would abolish ‘iman’ and cause breakage of one’s marriage. Stay firmly in right-iman until death. If a person reminisce these issues regarding ‘iman’, insha-Allah (if Allah wishes) he would be given a death with iman. Because of not having the proper and relative knowledge about ‘iman’, often At time of woe and adversities people pronounce such mischievous phrases or words that would certainly destroy their ‘iman’ along with breakage of marriage and all of their past worships. 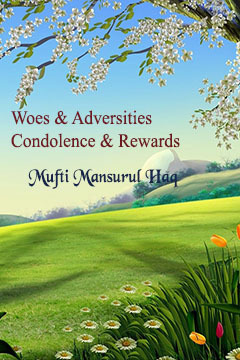 In order to defend or protect one from such predicament, the mentioned book has assembled very few verses mentioned in the Quran and Ahadiths regarding ‘woes and adversities’ where declaration condolence and rewards are narrated. So that it would become easier to have condolence, keep patience during woes or dangers. Furthermore, Allah ﷻ has kept myriad blessings and rewards within ‘woes and adversities’; pondering as such we should assume this calamities as a favor from Allah ﷻ.
Allah ﷻ is the master of the entire universe. Within His ﷻ ownership are our health and wealth, parents, wives and children, everything. Our claims of ownership of these (above) are not actually justifiable. One of the reason is we have sold our ownership (?) to Allah ﷻ in exchange of Jannah (paradise) (paradise). Allah ﷻ has every right to take any decision for our behalf; no one has any right to ask questions regarding any of His ﷻ decisions. Being unsatisfied and complaining against decisions of Allah ﷻ is an ‘act of paganism’, resulting in loss of iman. The duty of His ﷻ slave is that, if the decision is in favor of his (slave) desire, he would praise and thanks Allah ﷻ, and whenever the decision is in against of his (slave) desire, he would praise Allah ﷻ and keep patience. In essence, The owner makes decisions; no one has any right to poke nose? Studying the following book attentively will insha-Allah ensure our mind would not distract and complain against decisions of Allah ﷻ regarding woes and adversities. As such, we can save our The-most precious treasure of – ‘iman’, ingsha-Allah. In the end, I pray to the court of Allah that He grant us all to be happy with any of His decisions and protect our iman therein; grant this book with the status of acceptance. May Allah reward everyone associated with the preparation and publishing of this book, especially my beloved Student Mawlana Mufti Abud Saiym; bless and increase (barakah) their knowledge and acts of good did (‘amal) – ‘Ameen’.